Sie können nur einmal am Tag eine Bewertung abgeben. Sorry, zu viele Bewertungen für heute abgegeben! Bewerten: Hat dir das Spiel gefallen? Battle buggy is a little car equipped with a bug gun. 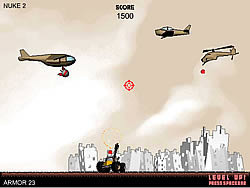 The objective is to dodge incoming fire while shooting down the air raid. From time to time your buggy is leveling up, and you get to upgrade your armor, machine guns or nukes.